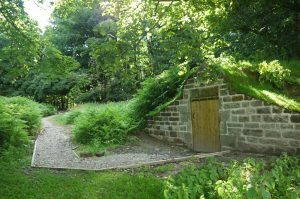 Changes can already be seen at Fishpond Wood thanks to the hard work of the owner, Dr Peter Brambleby, the Nidderdale Conservation Volunteers and trainees from the Foundation Programme for Heritage Skills. Work has included woodland management to control the spread of rhododendron and working on clearing and restoring the pathway that links the pond to newly repaired icehouse. Woodland management and path restoration works are ongoing at the site. The interior of the icehouse is in remarkably good condition, however the exterior frontage was in need repair. Prior to the consolidation works, the icehouse was surveyed providing a detailed record which includes a 3D model of the interior and exterior. The repairs to the front elevation of the icehouse were undertaken in June 2015. In addition, a grille was installed between the tunnel and the deep chamber, and the door replaced. During July 2016 a solar powered light, activated by a motion-sensor, was installed in the icehouse pit, enabling visitors to view the interior of this fascinating structure. In September 2015, Peter undertook the task of dredging the pond. Silt had built up in the pond over many years, making it much shallower. By dredging it, it is hoped that this will help to preserve the pond and also have significant benefits for the wildlife; perhaps a boat could once more be rowed on the waters. 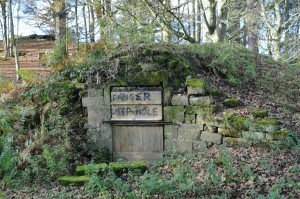 The Landscape Partnership is grateful for additional support from Friends of Nidderdale AONB, The Greenhow Fund, Harrogate Borough Council, Yorkshire Gardens Trust, and the owner, Dr Peter Brambleby, in the works to Fishpond Wood.